Quinn was kind enough to pitch in for Thanksgiving by making a few dishes of his own, one of which was this beautiful apple pie. Being prone to research, he gathered quite a bit of information before digging in. 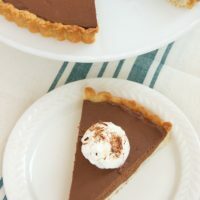 As a compliment to this post, check out his pie crust adventure, too. Jennifer had her hands full this Thanksgiving as she had taken on the majority of the cooking for 16 people. 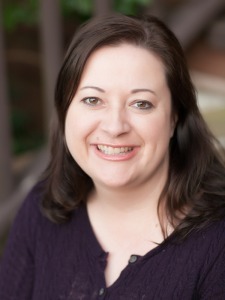 I was able to take off Wednesday to lend a hand as needed with her numerous concoctions and to work on three of my own. Of course, given my favorite baker’s aversion to raw meat, the turkey was all mine (this year, anyway, as I was not struck down by some wretched little bug). I also made a focaccia seasoned to compliment the dressing Jennifer made (which, unfortunately, never made it in front of a camera). My third contribution was an apple pie. I’ve been itching to make a pie since watching Alton Brown’s pie episode, Crust Never Sleeps, so I based my pie on his method. The crust preparation was discussed at length in another post, so I’ll move right on to the filling. 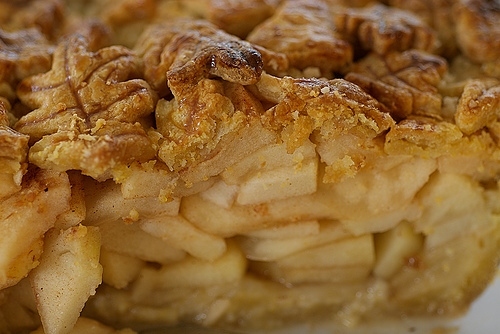 Performing a Google search for “apple pie recipe” returns a sizable list, upwards of two million results. Utterly daunted by this, I fled to Jennifer’s cookbook shelves where I lost count of baking-specific tomes. My daunt renewed, I sat down and reached for some biscotti which was perched atop Martha’s Baking Handbook. I felt certain this was no coincidence. 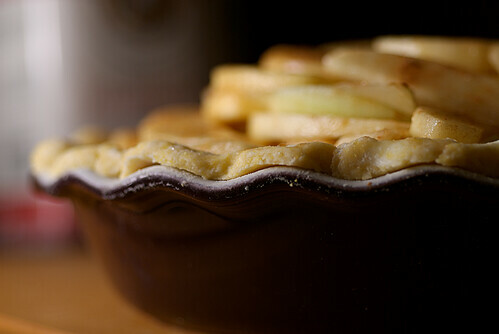 I quickly found her Classic Apple Pie recipe and was swayed by the photograph (fueled by my escalating hunger). In her brief prelude to the recipe she says that it “was inspired by the large selection of apples available throughout the autumn months at the Union Square Greenmarket.” Whenever Jennifer and I get a chance to visit the Greenmarket, it makes us giddy at first, then devastated by the thought of returning to our local produce selection. Beyond the fond memories resurfaced by the description, the thought of employing a variety of apples in my pie appealed to me. Oh, and an egg wash made with heavy cream instead of water? Are you freakin’ kidding me? I was sold. The peeling, coring, and slicing was by far the most difficult part of this pie filling preparation. Once they are sliced up, the apples are tossed with flour, sugar, spices and some lemon juice to prevent browning. I stacked the apples as high as I felt was safe from a structural engineering perspective, but the pie found a way to settle and shrink a little during baking, so don’t fear stacking a tall pie. Jennifer was very excited because this marked the first use of her pretty new Emile Henry pie plate. The color had a rich look of fall and accentuated the autumn feel of the dish. On our recent trip to NYC, Jennifer found some cute leaf shape cutters in anticipation of just this pie. Our initial thought was to have a solid crust atop the pie with leaf shaped vents cut out near the top, maybe a few leaf cutouts around the edges. Jennifer voiced an innocent little suggestion after I had the pie filling assembled and the top crust rolled out. “Oh, look on the next page.. Martha has little star shaped cutouts of crust dotted on top of that pie…” I’m not really certain how long she’d been holding back this idea, waiting for the right time, but she had to know with complete certainty that I would be inspired, that the image of a pile of fallen leaves would be irresistible to me. 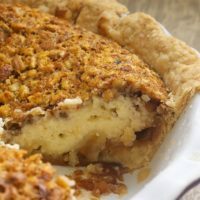 I got to cutting and converted the disk of rolled out pie crust to a mound of leaves and acorns, overlapping them slightly and sealing them along the rim of the lower crust with egg wash. So, how did it turn out? I think it was definitely worth the extra effort to make the leaves. The different apples gave the filling an interesting variety of textures and flavors. The spices seemed just right to me. It received lots of compliments during the Thanksgiving festivities, although it was certainly in the shadow of Jennifer’s pecan pie cheesecake (and rightfully so). 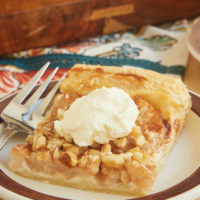 Apple pies have become ubiquitous, especially around this time of year. This is both good and bad. 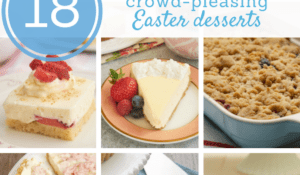 Ubiquity implies popularity, and what dessert in its right mind doesn’t want to be popular? But if too popular, a dessert loses its specialness. 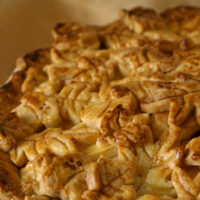 Making the pie stand out in the way it is made can help, but I think making the whole pie as delicious as possible will keep apple pies invited back to the party year after year. Roll out one portion of pie crust into a 12-inch round. Brush off excess flour. Fit dough into a 9-inch pie plate, pressing it into the edges. Trim edges to a 1/2-inch overhang. 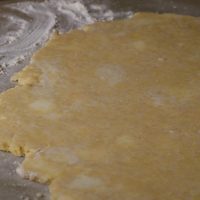 Roll out other half of pie crust to the same size and transfer to parchment on a baking sheet. Chill both until firm, about 30 minutes. In a small bowl, whisk egg yolk and cream to make an egg wash. Set aside. 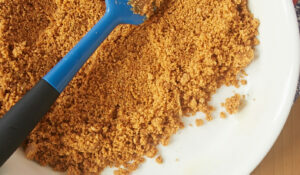 In a large bowl, mix apples, lemon juice, granulated sugar, flour, cinnamon, nutmeg, and salt. Arrange apples in pie shell. Dot with butter. 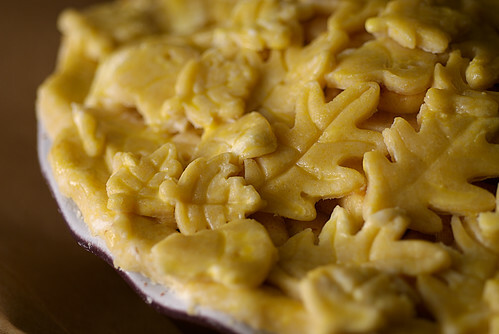 Brush the rim of the pie shell with egg wash. Cut out remaining rolled-out pie crust into desired shapes. Arrange cut-outs on top of apples to cover well but with some spaces for venting. Brush the top with egg wash and sprinkle with sanding sugar, if desired. Freeze about 30 minutes or until firm. Preheat oven to 400°, with the rack positioned in the lower third of the oven. 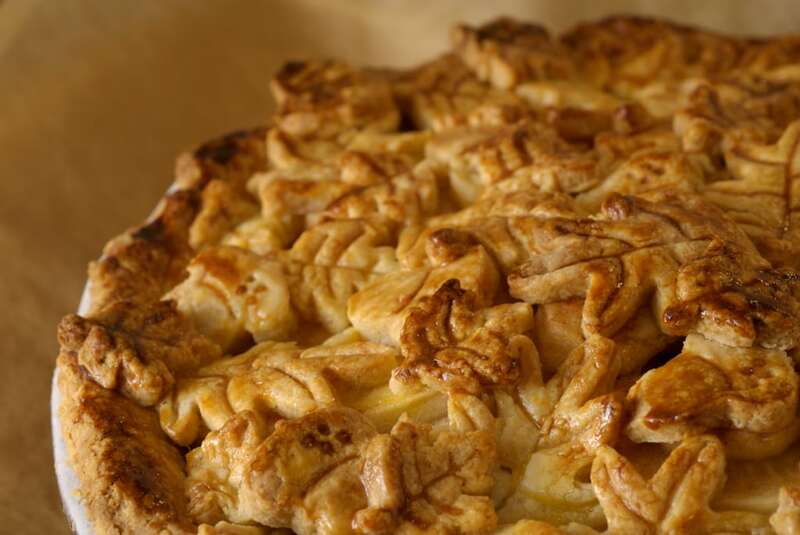 Place pie on a lined baking sheet. Bake about 20 minutes, until crust begins to turn golden. Reduce oven to 350°. Bake about 40 to 50 minutes, rotating pan halfway through. Crust should be a deep golden brown and the juices should be bubbling and have thickened. Cool on a wire rack. 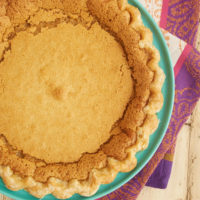 *You can also use a double recipe of this more traditional pie crust. Oh man, how gorgeous. It makes me want to go right home and make that pie tonight, special crust and all. Your guests were so lucky to have access to such a spread! And I’ve only heard about the spectacular desserts! I saw martha’s pie and I’ve been dying to try it – particularly after slaving over a fussy lattice crust for Thanksgiving (the classic looks nice too – but there’s not a lot of room for error!). I had the same thought on leaves and was thinking I’d have to hand-cut them – great idea finding leaf-shaped cookie cutters! 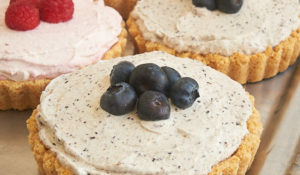 Such a pretty pie – great job! Oh man, the crust has me sold too! I’m just about to rummage through my cookie cutters. Love it! Thanks for recipe! Made this with the traditional pie crust, and it turned out lovely! Only wish I did leave the pie to cool for a bit instead of cutting it immediately out of the oven, as that part is crucial for the apples to steam to the right texture – my apple slices weren’t soft enough and the liquids were still too runny – all could’ve been avoided if I had let it cool! I had some problems with this pie. To be fair, I have little experience with pies, so my troubleshooting skills are minimal. The crust was quite problematic–hard as a rock after chilling (I guess just don’t let it rest in the fridge, then? ), so I re-processed it to start over. Worked well enough. 3 lbs of apples is much too much–try 50-67% of that and you will be absolutely fine. My pie is absurdly tall. It’s just in the oven now, so I’m praying the temps and times are right. Given how many apples I shoved in there, 1:00-1:10 doesn’t sound far off. I think I’ll stick to baked goods that rise from here on out. Who knew I’d be better at macarons than pie. 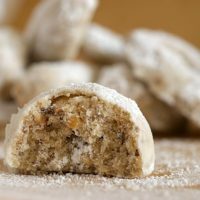 Sometimes after chilling the dough, it works better to leave it at room temperature for 15 minutes or so to make it easier to handle. The resting time is mostly for letting the gluten relax so it’s not tough. There are A LOT of apples in this pie. If your best judgment is to leave some out, then that’s perfectly fine.